I have recently realized that, while our friend the Spy Master has revealed his… ahem… “identity” a while ago, many among you might want to know a thing or two about his story. Being a Faceless, he’ll never reveal his secrets by himself, but I’ve known him for a while now and I’ve learnt a few of them. So let me tell you some things about Jorgen, Duke Ivan’s Spy Master. Ask anyone what they know about Jorgen, and they’ll probably describe him thus: a loyal servant of the Griffin household. A man who is versed in the lore of many disciplines. The “Jorgen” persona, however, is just an elaborate mask he crafted a long time ago, during the reign of Duke Slava of Griffin. Jorgen’s real history and true name are shrouded in darkness – as you know, he is not even Human, but one of the mysterious Faceless, Malassa’s first children. As he would say: “he is many, and Jorgen is one of them”. Whatever that means. 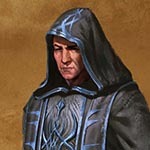 Discovered and nearly killed by the Inquisition during the Second Eclipse, Jorgen then disappeared from the surface world, reputedly to help the establishment of the Dark Elf kingdom of Ygg-Chall. Not much is known of his activities during that time, but I believe he maintained a watchful eye on the Griffin dynasty, helping them from the shadows without their knowing. Why he is so attached to the Griffin family remains a mystery. I suspect it may be at least partly connected to the fact that the Falcon dynasty was a bit too… “Elrathian” for Jorgen’s tastes, with its tendency to go on bloody crusades against all servants of Malassa every now and then. The Griffin line, on the other hand, is more open-minded. But while that explains his agenda, that doesn’t explain his enduring loyalty. 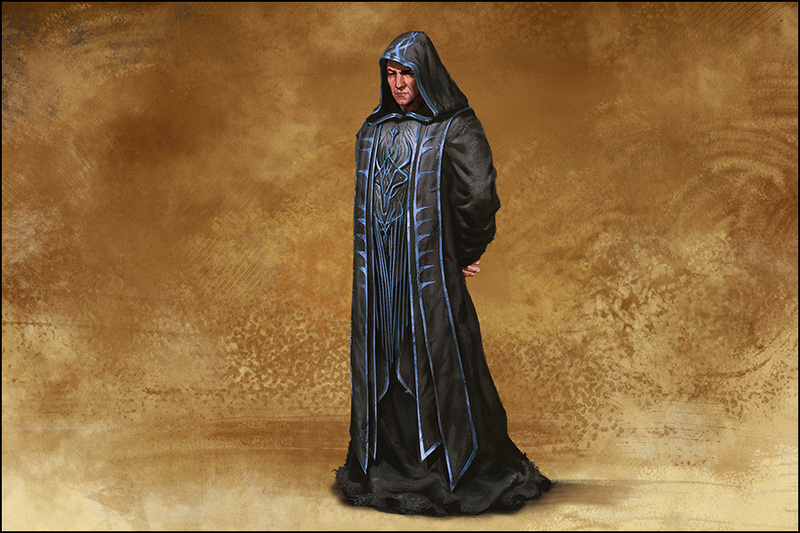 Jorgen possess immense knowledge and a timeless wisdom, but like all Faceless, he has an unnerving tendency to speak in riddles and metaphors. He’s likely to answer a question with another question, never giving straight answers. As a result, any discussion involving Kente and Jorgen is an endless source of entertainment. The reasons of Jorgen’s open return to the court of a Griffin Duke are known to only a few. That particular story is not for me to tell. What I can say is that with the Demon-worshipping Soulscar clan taking control of the subterranean realm of Ygg-Chall, Jorgen and the remaining Faceless were forced to scatter and hide. For Jorgen, the best hiding place was in plain sight – at Duke Vassily’s side. So Kaspar has told you about me. Do not worry, I’m not angry. What is done is done. I actually think it’s better that way. After all, how the old saying goes? Ah yes -- “The Faceless know no truth”. The day I tell you my story, you would be wise not to believe any word I say.